There are few things in life more comforting than a doctor with experience. We simply love older doctors because they’ve seen it all. While our imaginations often run wild over the implications of an ailment, they put a reassuring hand on our shoulder and say “This is nothing new, we’ve seen this many times before, and this is usually the outcome”. So far 2010 has been an exceptionally challenging year for most investors. In my experience, nothing drives investors more mad than headline-charged markets that make no progress. High volatility without a defined price trend has left both amateurs and professionals frustrated. The environment has been so challenging that even some of the world’s most successful hedge fund managers with stellar 20-year track records are throwing in the towel– many stating they just can’t generate a return in this environment. It’s not much of a surprise. At the start of the year we postulated that the overall equities market was headed for a protracted environment of high volatility and little progress. We used the 2004-2005 time frame as an example of the type of environment we may be headed for. The reason is quite simple: After periods of high velocity (2000-2002 Dot Com Blow Up, followed by the 2003 Fed Liquidity Rally) the market regularly enters a period of congestion, digesting the recent highly emotional trading. So far in 2010, the markets have lived up to the forecast, delivering a roller coaster ride of extremes with little return to show for it. We’ve endured new lows in housing prices, a “flash crash”, Greece debt defaults….and the ad nausea argument over the possibility of a “double dip” recession, and yet after a spectacular record breaking September, we find the S&P 500 back to almost even on the year. I have a long list of professional traders and hedge fund managers who all share the same feeling that 2010 has been one of the most difficult investment environments in decades. It seems that not a day goes by that a headline about inflation, double dip recession or the incredible national debt doesn’t generate mass conversation and debate. Everyone has an opinion, and few are fearful about expressing it. The result has been a chaotic market environment of starts and stops. The monthly chart below illustrates just how wild things have been this year. Take a look at the monthly volatility of even large cap, mostly blue chip stocks of the S&P 500 Index. Can you identify the trend? Two weeks ago I was having a conversation with a well-regarded hedge fund administrator about the current environment. She made a comment that struck me as odd, stating that it looked to her like 2010 was even more challenging than 2008 for most long/short equity funds. That’s quite a statement considering 2008 saw the S&P decline by almost -40%. Long-Short Equity is by far the single largest category for hedge funds. She’s not alone in her observation. Several well-regarded hedge fund managers with outstanding long term track records are shutting down their funds. “Paolo Pellegrini, a protégé of housing market short-seller John Paulson, would return money to outside investors by the end of September, though he would continue to manage his own money after challenging markets put pressure on his big bearish bet on global economies. Just two days ago, Stanley Druckenmiller announced plans to shut down his $12 billion Duquesne Capital Management, citing burnout after a 30 year career. Duquesne, which has never had a losing year, is down 5% in 2010. At least 8 hedge funds run by billionaires are flat or down so far this year. -Aug 20, 2010 Forbes Online. Mr. Pellegrini, Mr. Drunkenmiller and Mr. Botti aren’t alone. Eight months into the year, a look at any of the various hedge fund indexes illustrates the flat performance this year for long-short equity strategies. During more normalized markets, there is a healthy buying and selling across market asset classes, sectors and industry groups. For example, while Healthcare and Biotech stocks may be declining -1% for the day, Retail and Financials may be +1% for the day as money flows from one group to another. Many times even during major market declines, certain market sectors will outperform others. This difference in sector or industry performance is referred to as the “spread”. Not only have there been few consistent trends in 2010, but the correlation across asset classes such as Stocks, Bonds and Commodities has risen to historic levels. In simple terms, there has been little difference in the performance of one market sector versus another. On large rallies every sector is up, and on big declines every sector is down. The result is a market that is trading as one giant asset class, throwing the idea of asset class diversification out the window, and creating a real challenge for Global Macro hedge fund strategies. 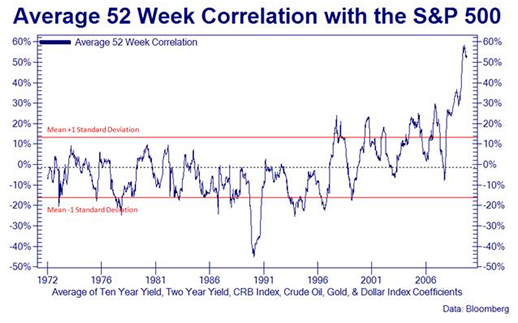 The chart below illustrates how highly correlated all asset classes have become with stocks. It hasn’t been much easier for Long/Short Equity. One of the most popular Absolute Return investment strategies in the Long/Short Equity space is buying quality, leadership stocks while simultaneously selling short low quality lagging stocks. Similar to the Global Macro example above, these strategies benefit from the spread between leaders and laggards. Below is a chart that measures the spread in performance of those stocks in steady uptrends, and those in steady down trends. It is a visual picture of the differences between leaders and laggard market sectors. After the last 9 months of market extremes investor anxiety is building. If this is you, let me put the proverbial experienced, reassuring physician’s hand on your shoulder. We’ve been here before, the current environment is no surprise to us, and flat returns this year are to be expected for Absolute Return managers. However as we enter the fourth quarter, there are several catalysts that may provide outstanding opportunity. Our views at the beginning of the year for flat results were correct. When it’s raining, do you increase your driving speed? No, you reduce your speed until the windshield is clear. It’s no different when it comes to investing. There are times to increase exposure to the markets, and times to reduce it. We have been muddling through a congested market with few opportunities, managing downside volatility and patiently waiting for trends to emerge. The wait may be just about over. There are a few things brewing under the surface that may be catalyst for an explosive fourth quarter. First, flows out of equity mutual funds into more safe havens are nearing record highs. The general public remains extremely skeptical, which is often a contrary indicator to future price moves. Second, the Federal Reserve has been injecting record amounts of liquidity into the markets through the purchase of various treasury based securities, through it’s POMO program. (More on this in a future commentary) History has shown that these injections of cash eventually find their way into liquid assets such as stocks and bonds, reflecting significantly higher prices three and six months out. Third, as you can see from the tables above many of the best hedge fund managers in the world are flat to down on the year. As the market indexes creep back to break even, incredible pressure will be placed on those managers to once again become fully invested for fear of lagging their investment bogey. If the markets begin to rally into the fourth quarter, mutual fund and hedge fund managers will be forced to increase exposure to equities, creating further demand and higher prices. Of course this is not a projection, but merely an observation of a potential catalyst. I believe we are more than half way through this consolidation of trends, and just a little more patience is required before Long/Short equity investors can reap substantial rewards. In the mean time we will continue to execute our investment strategies with disciplined risk management. ©2019 Anchor Capital Management Group, Inc. All Rights Reserved. Important disclosure information: This web site, and above links, contains information that has multiple authors and will offer multiple opinions on topics of interest. Any original written material on this web site, either authored by Anchor Capital staff, or external authors, are strictly the opinion of the author and not of Anchor Capital. If you find material that is inaccurate or defaming in any way, please contact us. No Solicitation or Investment Advice: The material contained on this website is for informational purposes only and Anchor Capital is not soliciting any action based upon such material. The material is not to be construed as an offer or a recommendation to buy or sell a security nor is it to be construed as investment advice. Additionally, the material accessible through this website does not constitute a representation that the investments described herein are suitable or appropriate for any person. Various links on this site will allow you to leave the Anchor Capital Web site. The linked sites are not under the control of Anchor Capital, and Anchor Capital is not responsible for the contents of any linked site or any link contained in a linked site, or any changes or updates to such sites. Anchor Capital is not responsible for any correspondence via email or any other medium, email list servers, webcasting or any other form of transmission received from any linked site. Links to external sources do not imply any official endorsement by Anchor Capital or the opinions, ideas or information contained therein, nor guarantees the validity, completeness or utility of the information provided. Anchor Capital shall not be held liable for improper or incorrect use of data or information contained in any electronic publications. Data, information, and related graphics contained in electronic publications are not legal documents and are not intended to be used as such. Anchor Capital gives no warranty, express or implied, as to the accuracy, reliability, utility or completeness of any information contained in any electronic document.